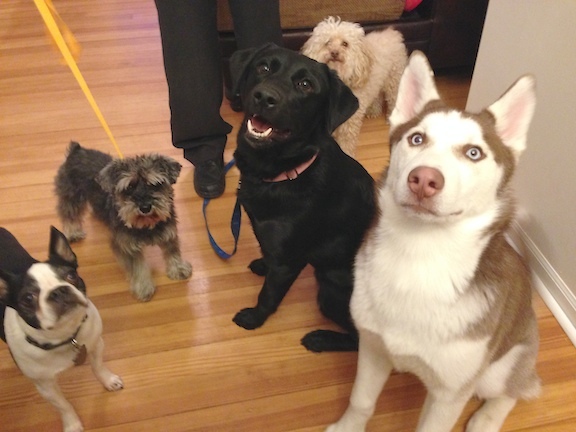 Meet Husker (four-year-old Boston Terrier), Cutie (eight-year-old Schnauzer), Lindsey (two-year-old Black Lab), Lucy (six-year-old Poodle) and Meeko (six-year-old Huskie). Their owner called me for assistance with several issues; aggression to visitors, getting over excited, not listening, barking and some fighting. When I arrived for the session, the dogs were clearly excited. As they live in the country, they don’t have as many house guests as most of my clients which translates to less exposure and practice. While the dogs were excited, I only witnessed a little aggression from one dog, Husker. However as soon as I turned my attention to him, Husker quickly moved away which is usually the case with dogs who are a little insecure. When discussing the situation with their owners, I learned that the dogs didn’t really have many rules or boundaries they were expected to follow. While human beings prefer a more relaxed, laid back lifestyle, Dogs (especially a pack of dogs) respond best to clear, confident leadership. Not only do rules and structure let the dogs know what is expected from them, it can often build up their confidence and they no longer “wonder” what is and is not allowed. I suggested their owners start to incorporate a few rules to help the dogs start to see their humans as their pack leaders. The first rule I suggested was to make the furniture off limits. Because dogs often perceive their authority as tied to the height at which they sit, keeping them off the furniture helps define a leader follower dynamic. By literally adding a difference between the humans and the dogs, we can help change their behavior. Next I demonstrated a leadership exercise that helps the dogs learn to focus, see their humans in a position of authority and restrain themselves. One by one I repeated the exercise with each dog then coached their owners through it as well. Husker took the longest to complete the exercise, likely due to his lack of confidence. By repeating this exercise with each dog a few times a day, their owners will be seen as holding more authority while the dogs learn to control themselves, staying calm and returning to balance. Towards the end of the exercise, a fight broke out between Cutie and Lucy. After separating the dogs, I went over the warning signs that their owners needed to watch out for while bringing the dogs back together in a controlled way. Many dog owners separate dogs after a fight. While this is a good way to prevent it from happening again, it doesn’t give the dogs the ability to learn a different way to interact. By bringing them back together in a supervised and structured way after they calm down, dogs usually learn to tolerate, and eventually like one another. I suggested that their owner walk the pair together, keeping both dogs at a heel. Walking dogs together in a structured way is one of the best rehabilitation methods an owner can use to help the dogs learn to tolerate and not be aggressive to one another. I learned that these two dogs had actually been separated from one another for a very long time due to the fighting. But immediately after the fight, when I had them back together, there was no aggression from either of them. I suggested their owners only allow them to be together when they were there to supervise. As time passes and the dogs start to see their humans as their pack leader and each other as members of the pack they are familiar with, the aggression should dissipate and eventually stop completely. By the end of the sessions the dogs were laying on the floor or walking around in a calm balanced frame of mind. Their owners were so happy to see that Cutie and Lucy could be together without fighting and the rest of the pack could learn to stay calm on their own. It will take a little time, practice and supervision, but I see no reason what this pack can’t learn to stay in a calm, balanced demeanor all the time.